The unrest that started in Iran after the presidential elections has flared up again recently. Tehran, Iran (CNN) -- Iran's Intelligence Ministry has compiled a list of 60 groups -- several based in the United States -- saying it considers them "soft war" agents against the country, Iranian media reported Monday. -- U.S. philanthropist George Soros' Open Society Institute in New York. -- The Washington-based nonprofit National Endowment for Democracy. -- The National Democratic Institute and its GOP counterpart, the International Republican Institute. -- The Washington-based Brookings Institution. -- U.S. National Defense University. Media outlets BBC and Voice of America are also on the list, as are the East European Democratic Center in Poland and British nonprofit Wilton Park, among dozens of others. Iran's deputy intelligence minister urged Iranians to avoid any "unusual relations" with the groups and with foreign embassies and foreign nationals. "He stated that it is illegal to sign contracts with these organizations, and it is also against the law for groupings and political parties to receive financial assistance from foreign countries," Mehr reported. 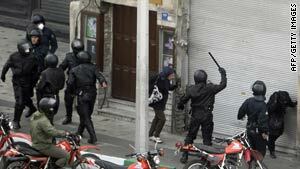 Such crackdowns have become commonplace in Iran since the summer, when thousands of protesters were arrested in the aftermath of Iran's disputed president election in June. The government has been trying to limit the flow of online information and other forms of communications in Iran, according to activists and human rights officials. Amid the unrest, Iran's judicial chief in July ordered the the prosecution of individuals "who cooperate with satellite television programming providers," according to reports by reformists. Ayatollah Seyyed Mahmoud Hashemi-Shahroudi called on local judicial heads to work with investigators to determine "intentions, objectives and their sources of financial, political and intelligence support" of individuals who "operate against the system," according to Hamshahri, a widely circulated pro-reform publication that has been in print for more than a decade. At the time, Iranian-American Kian Tajbakhsh, an independent consultant and urban planner employed by Soros' Open Society Institute, was among roughly 100 people accused of participating in a "velvet revolution" against the Islamic republic. Tajbakhsh, the only American on trial in Tehran at the time, resigned from his position with the foundation after he was arrested and detained for four months in 2007 on unspecified charges. He holds dual citizenship in Iran and the United States. Iran's election authority declared incumbent President Mahmoud Ahmadinejad the overwhelming winner of the June 12 race. Opposition supporters accused the government of fraud.